I'll do the test in September and I already finished OG, OG Quant, OG Verbal, GMAT 800 and I already read Manhattan SC and CR. Any recommendations to improve my score? My target is 700. GMAC has publicly stated that the Official Score that you earn on Test Day is within +/- 30 points of actual ability. Assuming a similar 'swing' in how your CATs function, your 7 CAT score results show that you essentially performed the same each time (about 650 +/- a few points). This consistency over the last 2 months Implies that you likely got "stuck" at this score level and never realized it. While you clearly handle certain aspects of the Exam consistently well, you're likely also making certain consistent mistakes. This often happens to Test Takers who use a 'book heavy' study approach. To hit your goal score, you will likely have to make some adjustments to how you handle BOTH the Quant and Verbal sections - and that will require that you learn and practice some new Tactics (and not just work through more practice questions). As I can see , you have still 1 GMAT prep test left. You have written only 1 GMAT prep test. 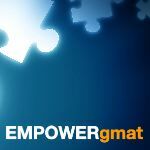 Why do not you write another GMAT prep test. These test are actual representation of official GMAt and very close to real performance. you should better concentrate on you weaknesses if you have made error log look at it find out you mistakes and overcome. Do practice 700 level questions and use only GMAC official mock test to know your current standing, review each test you have taken, meet the pace you require for the test build your stamina of sitting 4 hours. On the basis of your mock scores, I would recommend you to focus on the verbal section. E-gmat verbal online or the E-gmat verbal live are both amazing courses that can really help you improve your scores.